I finally did it, I ordered from Illamasqua! I've been meaning to for so long but I always get lured into new M.A.C Collections and end up using my money for that instead. I actually ordered this on the 29th of January. :| Which is a week and a half ago and only just received it today. Apparently their stock room was shut for stock take last week and there was a note about it on the site it. I'd love to know where because I didn't see it. I decided to just get one thing for now as you get 10% off your third order so I will be getting the majority of what I want then so I can save myself a little bit of cash. I also think it's a nice touch that they included a Dystopia postcard and a Product Guide Booklet. It's actually got some interesting stuff about how the brand started, how to recreate some of the promo looks and all of the products they sell. I also had no idea Dave Vanian was part of the Illamasqua Art Team. My Dad loves The Damned! 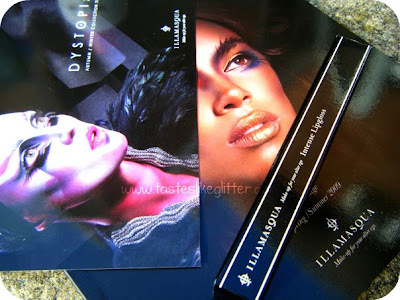 Now I want to know what your favorite things from Illamasqua are. I tried the Lipgloss this morning and I am in love. I'm curious as to what other people think of the brand/prices/colour range/finishes etc etc. So I'd love to hear any kind of feedback you have regarding this brand since it's still new to me.